Thousands of miles away from her Belfast home, Lynda Sullivan tells The Detail of her work to help Peruvian villagers in their fight against multi-national gold mining which threatens the future of their village. “Tell me why you’re involved in this peasant struggle in Celendin, Peru against Yanacocha one of the most powerful gold mining companies on the planet?” reporter Jesus Martinez, asks me. I’m here, I begin, because the mining companies wants to destroy the livelihoods of tens of thousands of people, the most of which live through agriculture and cattle rearing, by turning their mountain lakes into open pits, and by pumping toxic water into their rivers. And for what? So that they can extract the gold and copper from beneath. I’m here also because the people’s legitimate right to have a say in what happens to their land has been stripped from them by the national government as they order the police to violently suppress any form of resistance – a government who seems more concerned in protecting the economic interests of the mining companies as opposed to its citizens. “Yes” says Jesus, who is part of the socially conscience artistic collective Nadie Nos Paga, “but what I want to know is why you are in the middle of it?”. I suppose it all started at Amnesty International, Dublin four years ago where I met three women from Guatemala and heard how their community had been torn apart since a gold mining company had set up shop next door. One of the women, Maria, told us of the environmental destruction and the health problems that the mine had brought, and the horror stories of community leaders who were being assassinated for organising the resistance, including Maria´s husband. Such injustice, I remember thinking, all for the sake of a yellow metal. Two years later, after a lot of saving, I managed to get myself to Latin America. I spent the first six months improving my Spanish as I travelled, worked on organic farms, taught English and worked in bars. My plan was to travel from Uruguay up to Guatemala but on my travels I heard about more and more anti-mega mining struggles throughout Latin America, and I began to realise it was epidemic. 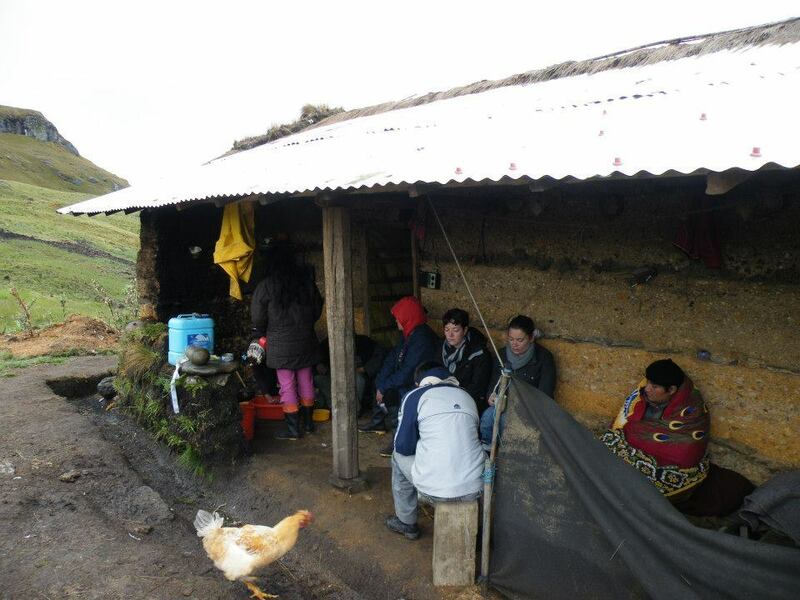 One in particular struck a chord with me, the struggle of the mainly peasant population of Cajamarca, Peru. In one of the provinces within this region, also called Cajamarca, for the past 20 years the company Yanacocha – an unholy trinity of US-based Newmont, the Peruvian Buenaventura and the World Bank, had created a huge open pit, so huge it can been seen from space, to extract gold and other minerals from the earth. Anti-mining campaigners claim the work led to the local water supply being polluted with toxic heavy metals and was responsible for a mercury spill that poisoned 1,200 inhabitants of Choropampa, and severely damaged water availability for agriculture. Now the company is nearly finished here and wants to move into the neighbouring province of Celendin to replicate its work; however this project – Minas Conga, will be three times the size. I heard of this struggle while in Bolivia, news had travelled that during widespread protests against Minas Conga five people were shot and killed by the national police and military, including a 17 year old boy. A state of emergency had been called to allow the government, and the ex-military President Ollanta Humala, to employ tactics of war against its citizens to suppress opposition to this six billion dollar project. So I decided to stop by. My plan was to spend a week there, write an article, and continue northwards. Five months later I was still there. I fell in love – with the people and the place. From the very beginning they welcomed me in and treated me as one of them – albeit with pasty white skin and blue eyes. On my first weekend in Celendin I was invited to join the locals as they travelled to the lagoons – where their water is ‘born’, to mark the one year anniversary of the resistance. 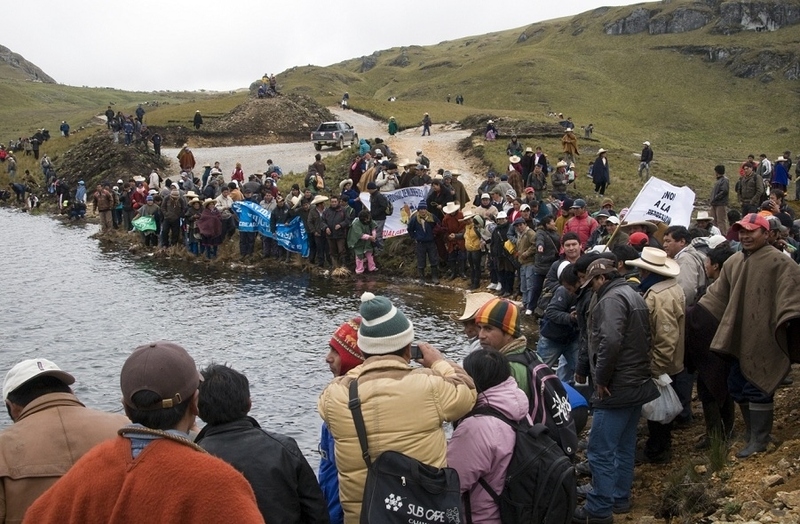 It was on that day a year ago that thousands of people from Celendin, and from the neighbouring provinces of Cajamarca and Bambamarca, came on horseback, on foot, in trucks, to pledge their commitment to the defence of their lagoons, their water, and their lives. The police also gathered – surrounding the newly acquired ´property´ of Yanacocha, which now subsumed the life-giving lagoons, defending a foreign company with their guns paid for by state money. Nineteen protesters were shot by live ammunition – one man received a bullet to his spine and is now confined to a wheelchair. The people, indignant, continued their protests – for seven months they protested relentlessly, showing their determination to defend what is rightfully theirs. Until July 2012 when they lost five of their friends. The police and the army had filled the streets and the skies of Celendin and Bambamarca, and fired at will into the crowds of protesters. Those killed included a 17 year old boy who was shot in the head by an army helicopter from above. Sadly, the protests turned into vigils. Despite the injuries and deaths, the people of Cajamarca are still defiant. Not only do they continue to organise themselves and voice their opposition, they also carry on with their lives. I have been living in Celendin and I´m struck by the joy in which people live. But the people are fighting multi-national companies with a lust for money; but they have something stronger – community, and they hope that this community will extend out beyond where they stand and reach other people who disagree that money should rule all. They hope to connect with other communities who are fighting their own struggles and stand in solidarity in the hope that someday they won´t have to fight and they can live in peace.